(By Susan Stern — Omaha Neb) — Achoo! Oh, spring is here alright, judging by the sneezing and wheezing that some of us suffer when pollen counts start to rise. If you have allergies or asthma, here’s a tip. Regular HVAC maintenance can help control the symptoms. You can nip allergies in the bud by calling your AC repair company for a seasonal air conditioning maintenance check recommends the respected Mayo Clinic, which also states that you consider purchasing “high-efficiency filters.” Plus, following annual maintenance schedules of your home cooling system is especially important for people with allergy/asthma. Allergy and asthma sufferers would greatly benefit from installing a high quality air cleaner from your AC company, rather than buy a cheap portable one found at the local store. 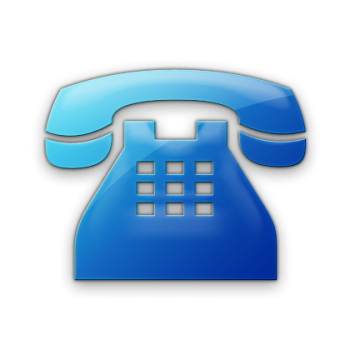 Consider contacting your HVAC company for a quote before you buy an air cleaner in Omaha. 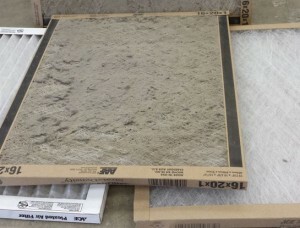 Dirty filters contribute to poor indoor air quality, dust buildup in your system and restricted airflow. Choose a filter with a Minimum Efficiency Reporting Value, or MERV, rating of at least 8 to trap the most allergens possible. Sneezing? Wheezing? That’s your cue. It’s time to call your AC repairman. After all, your home or office air conditioning system can actually act as an ally in the battle against allergies provided the HVAC system, a.k.a., air conditioners and heaters, is well-maintained and circulating clean air. When all is running right as determined by your HVAC pro, you might want to know that air conditioners help reduce the amount of humidity in the home, to prevent mold and dust mites from forming. Consider keeping indoor temperatures between 70 F and 75 F, and relative humidity level at 50 percent or lower. 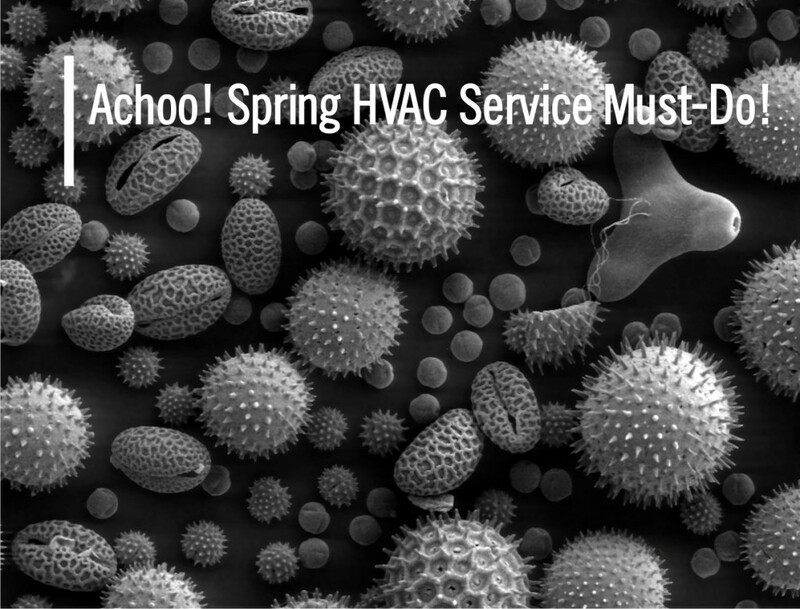 With spring allergy season in full gear, now is the time to call your local HVAC maintenance company that can make further recommendations based upon the type of AC unit you have in your home. 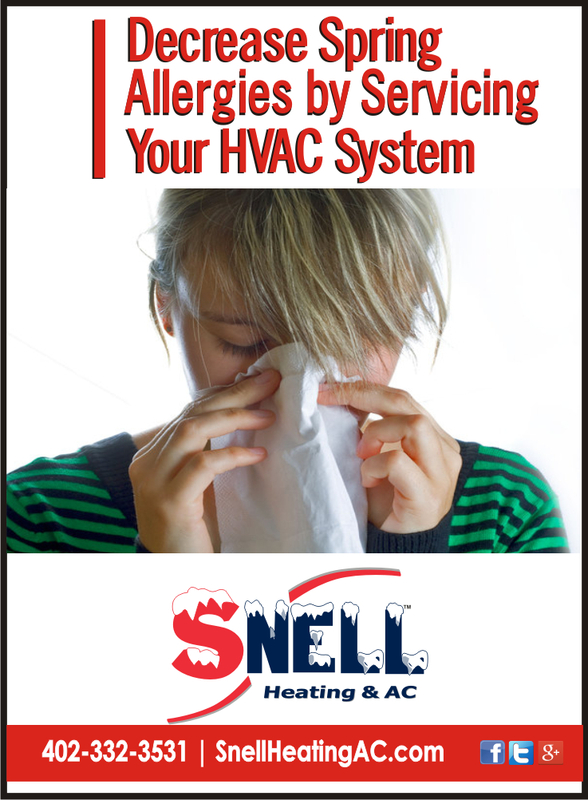 For more expert advice about how HVAC maintenance can lower the population of spring allergens in your Omaha, Bellevue and Gretna, Nebraska-area home, please feel free to contact Snell Heating and AC. Service to the Highest Degree! The 2015 tax season is in full swing – a great time to allocate your tax refund to big ticket purchases that protect one of our biggest investments – the home. If your furnace is 16-to-20-years old, it may be time for a new one. 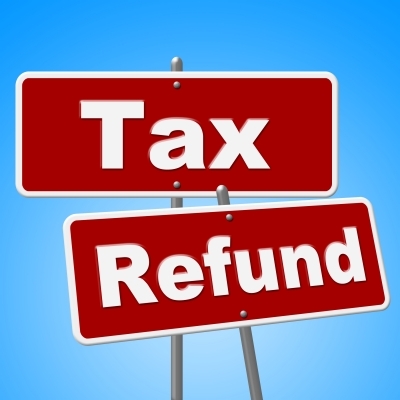 Using a tax refund to purchase important big ticket items like a new furnace or air conditioning system, are always wise choices. How Long Do Furnaces Run Right? The life span of a furnace depends on the quality of the furnace installation, efficiency of the system and regular maintenance care. Still, many HVAC experts suggest homeowners should consider replacing an old furnace around 16 to 20 years. You should begin shopping for a replacement, if your furnace is close to this age range or older, or faltering more frequently rather than wait for an emergency which may trigger a panic and more costly decision. Just a quick note, if your furnace has a pilot light, it is probably over 25-years-old! Ouch. When you buy a new furnace in Omaha, you’ll reap the benefits of purchasing today’s better quality manufactured furnace systems, which offer greater efficiency and improved components than those made ten years ago. Of course, to extend the life of your current furnace, it’s important to work with a reputable heating and air conditioning contractor to promote a long life span. A preventative maintenance plan is always a wise choice, keeping maintenance costs low. 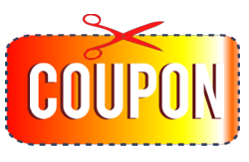 Should parts need replacing or fixing, discounts are always offered. Snell Heating and AC, an Omaha metro heating and cooling company, offers a cost-effective annual Customer Care Agreement. Rather than get a home equity loan or HELOC with increasingly higher interest rates expected to perhaps rise this year, if your tax refund is a healthy amount, you might want to use those dollars to purchase home improvement products like a new furnace or AC. Here at Snell Heating and AC, financing is available with approved credit. If you have any questions regarding the life span of a furnace replacement or new install in your Omaha, Bellevue, Elkhorn and surrounding area home, contact Snell Heating and Air Conditioning of Gretna Neb. (Gretna, Neb) — With Nebraska winter temps dipping to cold extremes, furnaces are working full-time to heat our homes. 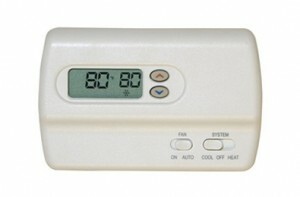 People often rely on secondary heating sources like space heaters to stay cozy, especially in bedrooms. But before you turn on the space heater, we here at Snell Heating and AC in Gretna Neb, recommend checking to make sure you’re taking steps to avoid a house fire. The National Fire Protection Association calculates that space heaters trigger an estimated 32 percent of house fires in America each year, resulting in close to 500 deaths, 1,550 injuries and $1.1 billion in direct property damage. So fire prevention is an absolute necessity. 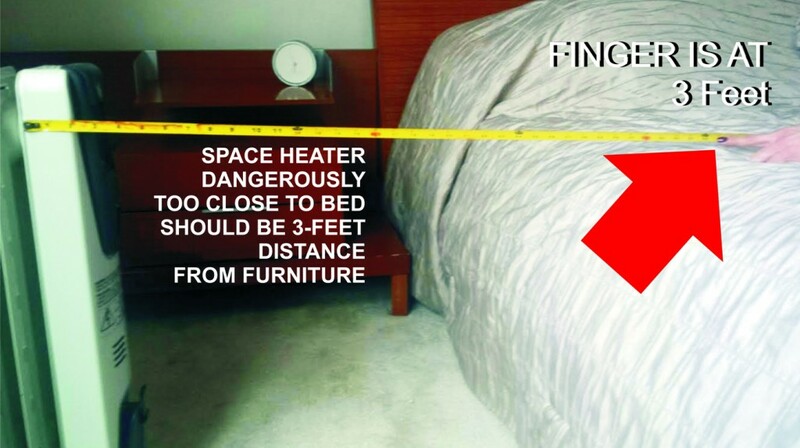 More specifically, the NFPA reports that the “leading factor contributing to space heater fires in general was heating equipment too close to things that can burn, such as upholstered furniture, clothing, mattress, or bedding.” Other reasons are failure to keep space heaters clean and leaving a space heater on and unattended. We hope these space heater and furnace safety tips help keep your family safe this winter. Snell Heating and Air Conditioning. Service to the Highest Degree! As we enter a new year, Snell Heating and AC wishes you the best in 2016! Thank you for being great customers, too. Remember. Should you need to buy a new furnace, our Gretna Neb based heating and cooling company is there for your home and business. Residential and Commercial home comfort! We also offer 24 hour furnace repairs Omaha, Elkhorn, Valley, Waterloo and Sarpy County Nebraska. Stay Warm Count On Us! In Nebraska, heating isn’t a luxury – it’s a necessity. This is why our Omaha area Neb heating company is available 24/7. Whether you need an emergency repair, a new unit, or maintenance, call our heating experts. We’re not a franchise. We do not upsell or inflate. Call Snell Heating and AC. We offer Service to the Highest Degree, serving Bellevue, Gretna, Ashland, La Vista, Papillion, Elkhorn, Waterloo and Valley Nebraska homeowners and businesses. We offer furnace repair, installation and service. Once we repair or install your new heating system, we offer you safety and security with an annual maintenance plan to keep your investment in tip top working order. Most furnace, heat pump or geothermal unit manufacturers offer warranties. Oftentimes the warranty only remains valid you you get annual service. Our Omaha area heating installation service and maintenance plans will make the most of your heating system! At Snell Heating and AC prides ourselves in providing a team of veteran HVAC technicians you feel comfortable having in your home or office. We also strive to go above and beyond by offering reminder appointments, friendly customer service and 24 our help in case of an emergency such as a furnace going out in the dead of winter. Count on our family-owned Gretna-based Heating and Cooling company. We serve Sarpy County and Douglas County cities. 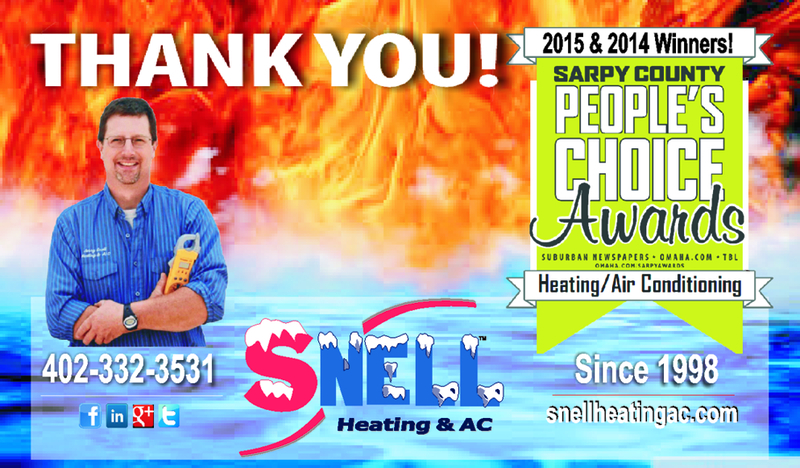 Snell Heating & AC Wins Sarpy County People’s Choice Award! Snell Heating & AC Wins Again! Troutman noted that the campaign, in its second year, is picking up speed. She said over 30,000 households cast votes in the 2015 Sarpy County People’s Choice Awards, up by 13,000 from last year. The award program is a brainchild of the Omaha World Herald advertising department in response to “the success of the Best of Omaha” that Sarpy County businesses are not permitted to participate. “We wanted to showcase Sarpy County businesses with awards they deserve since they have been left out of the Best of Omaha campaign,” emphasized Troutman. The award winners will be featured in a Nov. 18 magazine that will be inserted in the Omaha World Herald, The Gretna Breeze, Papillion Times, La Vista Sun, The Bellevue Leader and The Base (Offutt Air Force) newspapers. “Thank you, thank you, thank you. We really appreciate the honor. 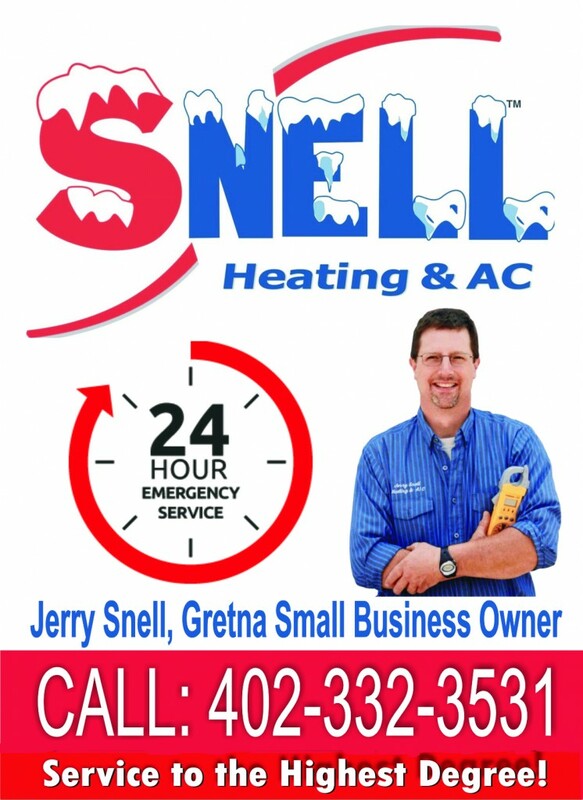 We are always here to help,” said Jerry Snell, the owner/operator of Snell Heating and AC. As the slogan goes, Snell Heating and AC. Service to the Highest Degree! 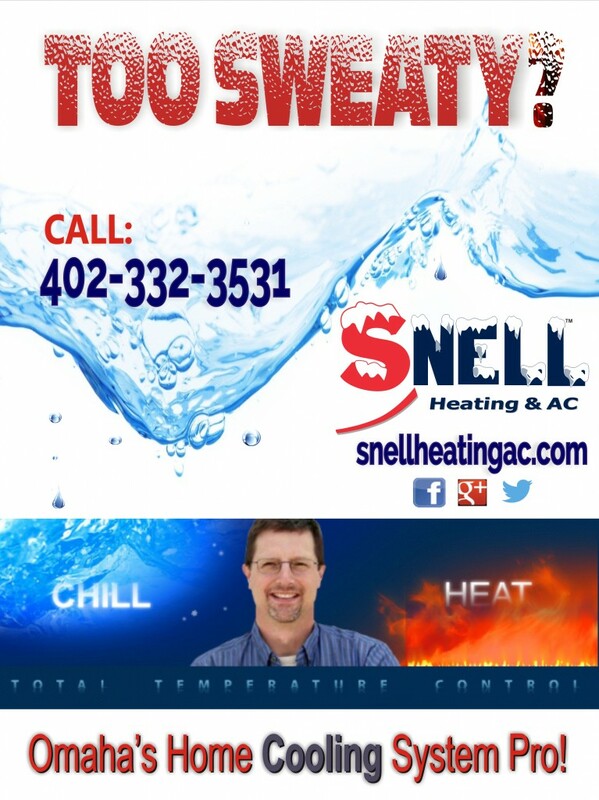 Call Snell for all your heating and cooling needs! Our heating and cooling company serves Bellevue, La Vista, Papillion, Ashland, Offutt Air Force base, Elkhorn and Omaha, Nebraska. 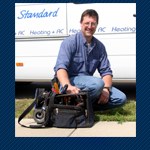 Schedule Heating and Cooling appointment online here! Not a franchise. With temps starting to fall overnight, experts say the time is now to test your heating system before cold weather settles in for the winter. Before you turn on the heat in your home, Snell Heating and AC recommends you have your furnace professionally inspected by our metro Omaha furnace repair company – once a year. 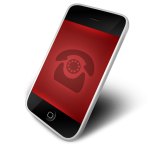 September and October months are the times to schedule a service call. “You should treat your furnace like your car. You would not wait until your car broke down to maintain it,” said Jerry Snell, owner of Snell Heating and Air, an HVAC company based out of Gretna Neb. After having a few months off, some furnaces and home heating systems require extra attention to make sure they’re fired up and ready to go for winter. Snell emphasizes that a once-a-year furnace check by a professional is essential to clean the system, monitor gas and heat levels and make sure everything is properly connected. Annual Maintenance of your heating system also ensures you get the best bang for your utility buck. Outsourcing furnace servicing to an Omaha heating company is not only important for your safety, but also makes sure all of the components work right. Without a regular service inspection, a heating system can break down, pump carbon monoxide into your home or the furnace can stop working completely. A neglected furnace can lead to a variety of problems ranging from costly, dangerous and even deadly. What can you do? Our Gretna Neb based heating and cooling company that serves Omaha, Bellevue, Papillion, La Vista and Ashland Nebraska notes there are a lot of do-it-yourself tasks homeowners can do to prep for fall heating. Change the furnace filters once a month to every 60 days. Inspect your home and seal drafts, so warm air is not wasted. Snell points out that homeowners should invest in a carbon monoxide detector, to spot any threat when furnaces and heating systems are up and running. 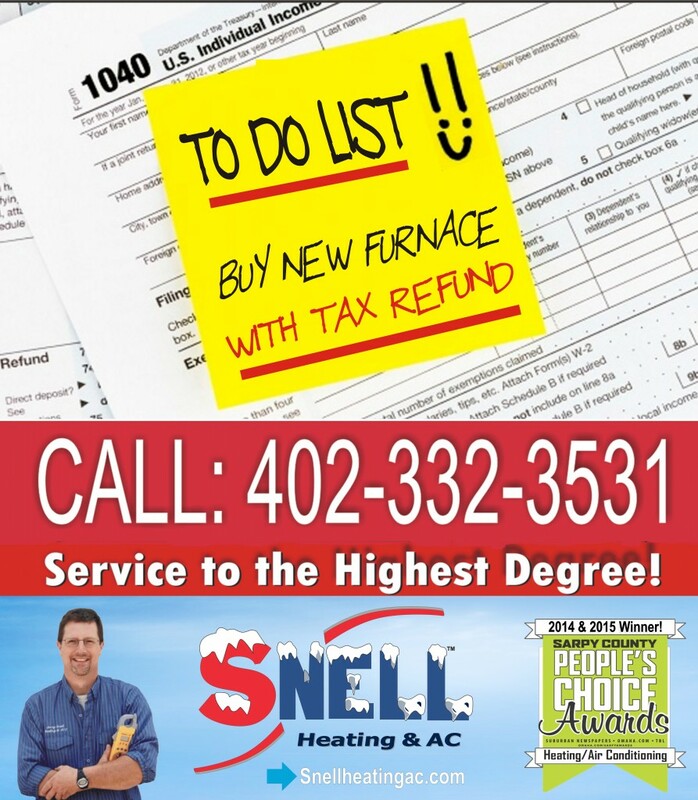 Contact Snell Heating and AC for an Omaha area fall furnace service. Get your furnace checked out before winter strikes! Call 402-332-3531 | Schedule Appointment Online! 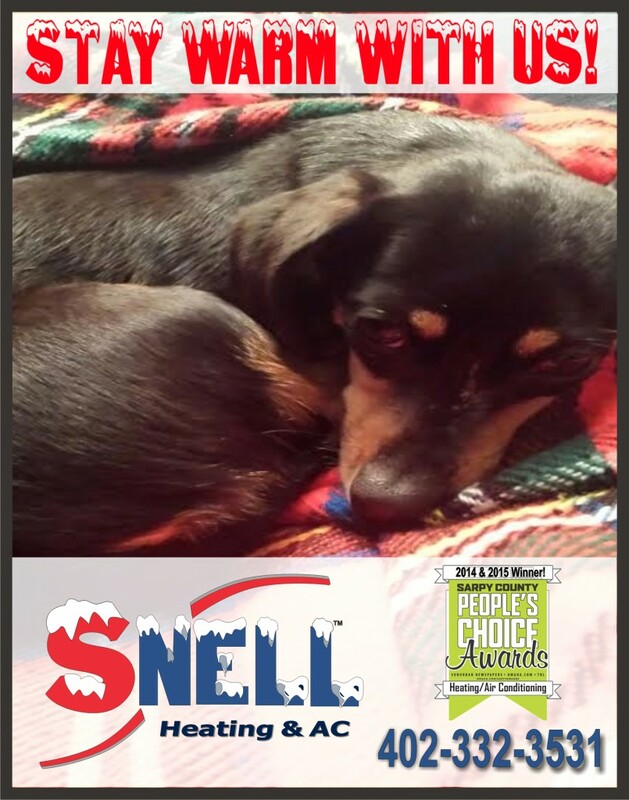 Snell Heating and AC thanks you for choosing us last year. 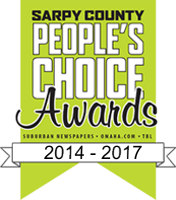 Right now voting is underway now for the 2015 Sarpy County People’s Choice Awards. We hope you might consider our Gretna Neb. based heating and cooling company again this year when you vote here. Voting ends Sept. 9, 2015. 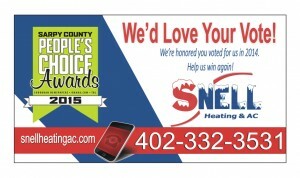 Last year, voters in Bellevue, Papillion, La Vista, Offutt, Springfield and Gretna NE chose Snell Heating and AC as one of the top three northeast Nebraska furnace and air conditioning service and repair companies located outside of Omaha. We appreciate the vote of confidence! Thank you. The Sarpy County People’s Choice Awards is sponsored by the Omaha World Herald. In its second year, the contest recently released a more modern, fresh logo to coincide with the mission, as shown above in the graphic. 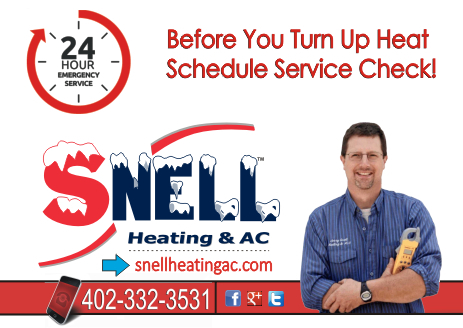 Snell Heating and AC’s service area is in both Sarpy and Douglas Counties. Call us if you’d like a Fall furnace maintenance check up. Learn why Snell Heating and AC outshines the competition with a more thorough check up, here. We turn a wrench! Gretna-based Snell Heating and AC received quite a surprise last year! 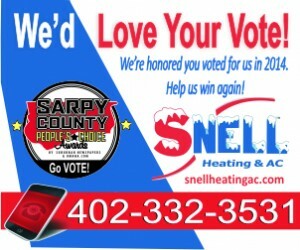 Residents in Bellevue, Papillion, La Vista, Offutt and Springfield, Nebraska chose Snell Heating and AC for the “Sarpy County People’s Choice Awards.” We were picked as the top three Omaha metro heating and cooling companies. “We are honored for the designation. Providing top quality product and service are our priorities. We are a family-owned HVAC company. We take pride in going the extra mile for each customer,” notes Jerry Snell, the owner. Campaign organizer Natalie Troutman says the “Spary County People’s Choice Awards” came about since the “Best of Omaha” program does not include businesses outside the city limits. “So, this is why we do the “People’s Choice Awards” here, to give Sarpy County businesses some love.” Troutman is an account executive for the Gretna Breeze, who also oversees this annual program. Voting begins Aug. 12 2015 and runs through Sept. 9. Troutman says 78,000 homes in Sarpy County will receive a ballot urging them to go online to cast their vote for their top 10 favorite businesses. Ballots will be sent to OWH-owned papers including the Omaha World Herald in Sarpy County, the Gretna Breeze, Bellevue Leader, Papillion Leader and The Base: 68113 (Offutt Air Force Base newspaper). A hyperlink is not yet live, but will be when voting commences on Aug. 12. Winners will be notified between Sept. 16-23. In the meantime, call us for heating and cooling company service. 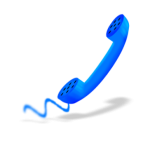 Serving Bellevue, Gretna, Papillion, Springfield, La Vista and Omaha metro! Signs Omaha Air Conditioner Needs Repair | Snell AC! Omaha AC company tips. There a myriad of signs and symptoms that it may be time for a home or office air conditioning system overhaul. Schedule an Omaha Neb Air Conditioning Repair service call today. Snell Heating & AC. Service to the Highest Degree! Family-owned. Not a franchise. We do not up-sell or inflate.